I’m going to pretend that my pregnant self did NOT just inhale a plate of hot wings. 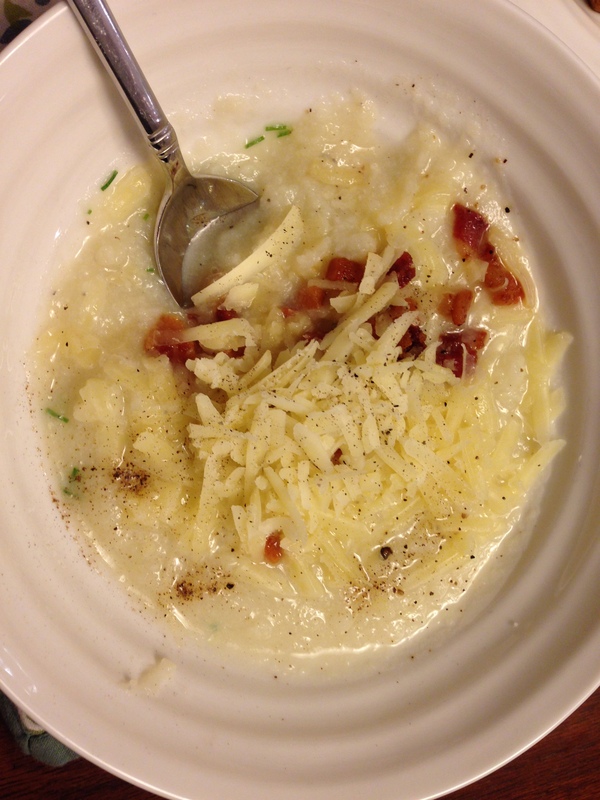 Instead, I’m going to post THIS tasty and low-fat Baked Potato Soup recipe. It’s a win-win for all of us: I get to remain in denial and you get to make a low-fat recipe. See how that works? I’ve talked about Skinnytaste before, so it should be no surprise that Gina is at it again. She has taught me some really valuable tricks, but my favorite one (I think) is substituting cauliflower in recipes when I can. Cauliflower can provide great texture and will absorb most any flavor. So rather than loading your potato soup with TONS of evil white starchy potatoes, you can cut it in half and add cauliflower to balance it out. Best part? One cup of this soup equals 5 WW points, which isn’t bad at all. Don’t follow my bad example by adding pancetta instead of turkey bacon. My pregnancy seems to be dictating really bad behavior. But hey, it is better than french fries. ….and better than a plate of hot wings, I’m guessing. Gah.